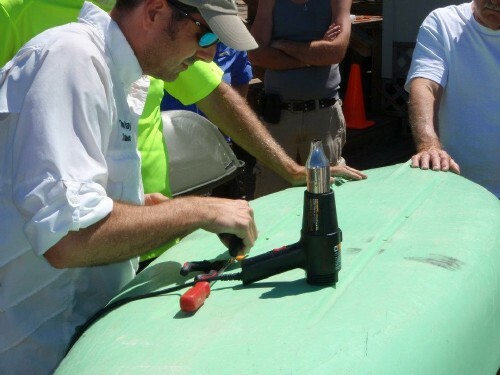 Salt Springs Alliance sponsored a kayak repair seminar on Sunday, March 25th, 2012. Tom Doehleman, of Osprey Bay Outdoors in Clearwater, was our instructor. It was a beautiful, sunny afternoon for the event, attended by about 20 people. Tom explained how different types of kayaks are designed and made, and how a do-it-yourselfer can repair holes or cracks in the hull to stop leaks. Six kayaks owned by the CSO were inspected and repaired as part of the class.